NES Classic Edition, A Retro Blast from the Past! You can also purchase a 2nd joystick for 2 player gaming action for any of the 30 titles that support two player modes. For all the details visit www.nintendo.com/nes-classic. What’s extra fascinating about this announcement is that my wife and several of my non-gamer friends (including a neighbor) have discovered this news and have shared it with me. The word has definitely gotten out and a lot of people seemed to be getting very excited for this release. With any luck we’ll see a SNES Classic Edition next! *Click here for SNES Classic Edition. 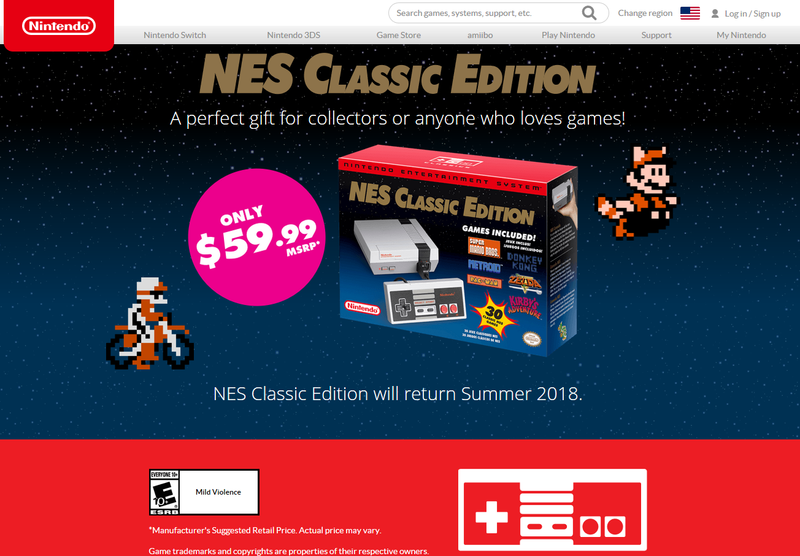 **Update: 2017-11-06: It’s been very hard to get the NES Classic Edition with limited additional stock disappearing instantly. But there is hope. Nintendo is promising more for this coming Summer 2018. Yep, same thing around here on this news. People asking me if this would be a cool gift for a kid, others waxing nostalgic, et cetera. The BIG issue will be supply and demand, I bet. I will definitely snap one of these up as soon as they are released. You’re right, it’s very possible they might disappear fast. *And of course I’m hoping that this Classic NES really truly does play these NES games exactly as well as the original NES does. In my excitement it’s easy to forget that we don’t yet know it’s caliber… but being produced by Nintendo themselves I’m not too worried. It’s basically a Wii minus the disc drive,Wiimote and expansion capabilities running eShop NES games (which are all perfect as fas as I’ve seen). So yep, it’ll be as good as it gets. I didn’t know all those 30 titles are on the Wii shop. That is good news. It’s seeming very likely that this little NES will have what it takes. It’s a shame there is no way to expand it’s library. It was never said if it could or couldn’t but my guess is the 30 games is all it will ever do. In fact Nintendo of America did say that the device would be “standalone” and will not support an online connection or external storage. Thanks for the verification. I knew it would be too much to ask for but this Classic NES is still looking like a cool offering. I initially met this product with a resounding “Meh” and couldn’t understand the buzz around it. After a few days of thought and talking I realize I was looking at it from the angle of a collector and tech savoy guy. I have an original NES and a flash cart as well as know my way around and emulator so for me this was nothing exciting though I do now get how the average consumer (whom this is targeted to) would be excited. I just cant help thinking in the back of my mind it’s nothing a Rasberry pi, an NES shell and a USB NES controller couldn’t do better, without the 30 game limit and at a comparable price. But again that’s coming from a guy that’s a bit tech savoy. I can also see now how the “official” nature of the device and the need to not have to deal with legally gray ROMS would be a plus. Its not for me but I now see its appeal. Yes, I do get where you’re coming from. I already have most of the NES games that I care about and an original NES so why would I want the Classic NES?! I think it mostly the collector in me and the fact that I can put this min NES on a modern TV and have retro gaming option in some other place in the house. I’m also optimistic about the quality of this device since it’s being produced by Nintendo and not some unknown 3rd party. Hopefully it will scale well on HD TV’s and play just as we’re expecting it to. I also like hardware solutions vs. running an OS and an emulator. Inevitably something will go wrong with software and the system will need some TLC. Hardware of this era typically just keep truck’in along!